Perlino horses have cream coats with pink skin and blue or glass eyes, and are sometimes called pseudo-albino or cream horses. The cream colour can vary from a very pale off white to a pale coffee color. If they are not white (due to socks or other white markings) the lower legs may be shaded a little darker than the body. The manes and tails are often darker for perlinos than for cremellos, often described as coffee colored, or as having a yellow or tan cast. In reality it can be difficult to tell whether a cream horse is a cremello or perlino without information about its pedigree, and even then it can be difficult. 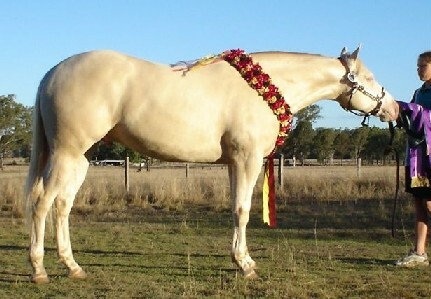 If one or both parents were buckskins then it is possible that the horse is either cremello or perlino. If both parents were cremello or palomino - or one of each - then the horse must be cremello. In addition smoky creams horses are sometimes confused with perlino horses, or called smoky perlinos. These attractive horses are in fact double dilute creams with a black base coat color. Perlinos have a base coat color of bay or brown and are homozygous for the CCr allele at the C locus (the cream dilution gene). Sometimes horses with a black base color are also called perlino, though these days they are more correctly called smokey cream, and may be quite a bit darker than other cream horses. CCr is semi-dominant and dilutes red to yellow in a single dose and to pale cream in a double dose, and has a more subtle effect on black pigment. Horses with a black base color are diluted to smokey cream, a color also called smokey perlino. Perlino horses can be used to produce palominos, buckskins and smokey blacks (also known as black buckskins), depending on their genotypes at the extension locus. The CCr allele does not occur in some breeds, such as Arabs, Haflingers and many of the draught horses. In these breeds there are therefore no cream horses, and also no palomino, buckskin or smokey black horses either. Perlino horses are sometimes called pseudo-albinos. In other animals (including humans) there are recessive alleles at the C locus that cause true albinism. Individuals homozygous for these alleles lack pigment in the hair, skin and eyes. Their eyes and skin are pink (due to the effect of the blood vessels beneath the surface) and albinism is often accompanied by various congenital defects. No true albino horses have ever been observed and presumably they are inviable (i.e. die in utero). The author also notes, from experience, that people often refer to perlino horses as being white, although this is not the case. Perlino horses have traditionally been shunned by some breeders and breed authorities, but are now gaining increased acceptance, thanks in part to the efforts of the Cremello & Perlino Educational Association (CPEA). Their research and campaigning helped to finally get the American Quarter Horse Association’s rule against the registration of cream horses withdrawn in 2003 (rule 227(i), formerly 227J). 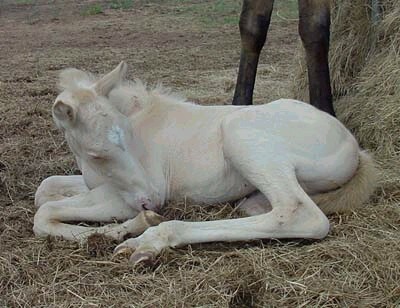 Under this rule cremello, perlino and smoky cream foals couldn’t be registered as pure-bred American Quarter horses even if the sire and dam were AQHA registered pure-bred champions with other AQHA registered foals. In the UK The Cremello Society - set up to promote the recognition and appreciation of cream horses - was officially registered in 2004. The Society provides a registry for all dilute colors, including cremello, perlino and smokey cream, as well as palominos, buckskins and smokey blacks. If you're interested in perlino horses you might also want to visit the pages about cream horses , cremello horses , smoky cream , buckskin , bay horses , brown horses or black horses.